Vehicles are one of the most expensive products we will purchase outside of our homes. They are also an asset that we take pride in and considering their cost we want to keep them clean and looking new. The issue is driving them causes build-up and wear and tear on the vehicle’s body. No matter where you live dirt and grime is not controllable. This can be especially frustrating when we care about how our vehicles look. The aesthetics of the vehicle can be a big deal but it can also affect the long-term effects of the environment and impact points. Any minor dents can start to rust which spreads across the body of the car. Minor chips in the glass with pressure and temperature changes can turn into major cracks. Somebody/glass damage is actually illegal to be driving around with as well. Any crack that is either in the line of the driver’s view or that is deep enough that it could break due to either another small impact or environmental change can land the driver with a ticket. It is so important to get on top of both dents and chips quickly for this reason. Our website has articles on how to fix scrapes and dents in the body of your vehicle and also how to fix chips in glass too. This article, however, is about the best car cleaning supplies on the market today. Keeping the car maintenanced regularly will help extend the vehicles life as well as retail value and lets others know you take pride in the appearance of your vehicle. We have created a list of car supplies that will keep your vehicle in its best shape. This list includes all the different areas of the vehicle like the body, tires, interior and carpets. No garage is complete without this entire list. Our top 3 list is a list of the products that really stood out to us. These products were extensively researched with help from consumers rating and reviews. We looked at both the positive and negatives of each product so that you are getting the best products on the market. We want you to try products that not only work but also that do the job. We also want you to be able to use these products with relative ease. So let’s get started, here are the best car cleaning supplies on the market today. This is a 13 piece, professional cleaning kit. This kit will clean both the interior and exterior of your vehicle including tires and glass. This kit is professional grade, so you know you are using products that are both good quality and won't damage the materials in your vehicle. 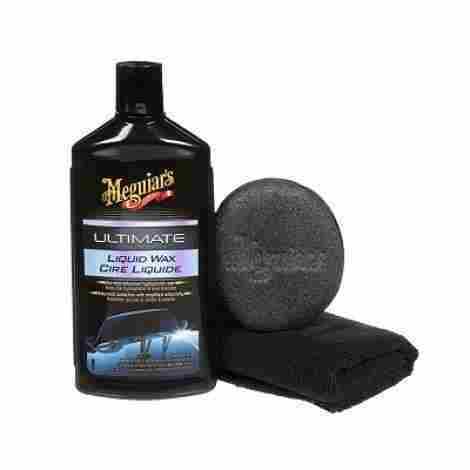 This kit is meant to clean and polish the paint, wheels, trim, glass and chrome of your vehicle. The entire package will do the full job and will last between 15-20 uses. This product is a little expensive. The price is justified by the amount of products included, as well as the quality of those products. For long-lasting protection, this liquid wax will create a protective barrier that will give your vehicle the perfect shine. It also comes with a microfibre cloth for easy and flawless application. 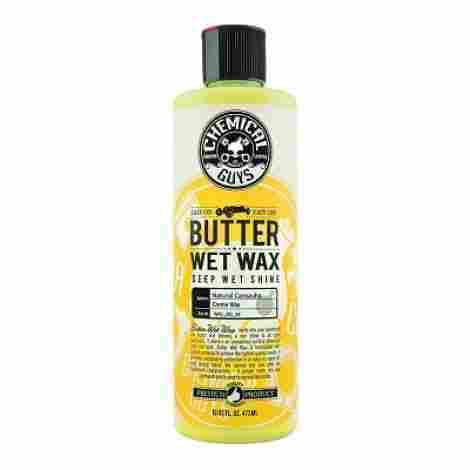 Because it's a liquid and not a hard wax, this product goes on easier and thinner. It allows the applier to use less product too for more applications later on. The wax has synthetic polymers that allow the wax to be removed easier, even when not fully dried for easier application and removal. This product is fairly inexpensive considering it comes with both the wax, the applicator and the microfibre cloth. It also is a liquid so you can get more uses out of it in comparison to traditional hard wax products. This is an 11 piece kit that includes car wash and shine solution (for tougher cleaning), a lighter car wash solution, a spray bottle for customized solution mixes, wheel cleaner, a bucket with a lid (that doubles as a seat), a wash mit, after wash, drying rags and a device for "grit-control" (keeps debris down to avoid scratches on the car surface from dirty water). 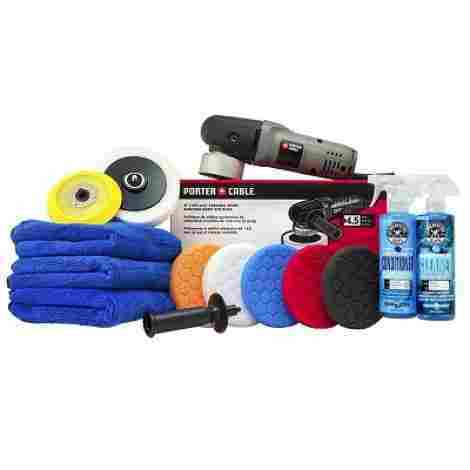 This kit has you completely covered from start to finish for all your car washing needs. These products are products used by professionals. All the tools included also make this kit incredibly easy-to-use. Considering everything included in this kit, it is reasonably priced. The price is justified by the fact that it has literally everything you need to wash your vehicle plus some. It is a bang for your buck. This is a high pressure, high-temperature pressure cleaner for the interior of your vehicle. It has heat control, has a built-in compartment for storage of the included brushes, and is portable. Allowing you to get your whole vehicle done in one shot. This cleaner relies on heat exclusively, no need for chemicals and kills 99% of bacteria. This machine is pretty inexpensive. It will pay for itself in one or two uses. It's definitely worth the price. 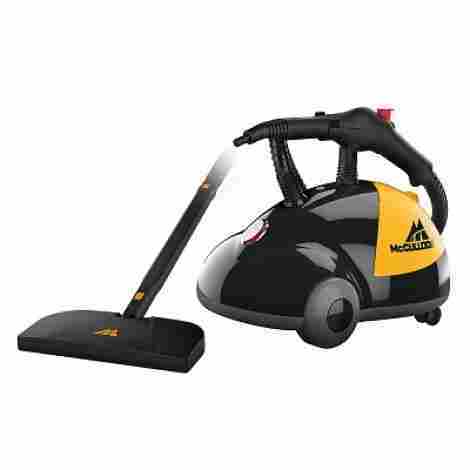 This is a strong steam cleaner for the interior of your vehicle. It comes with an extra long cord and has 1500 watts of power. 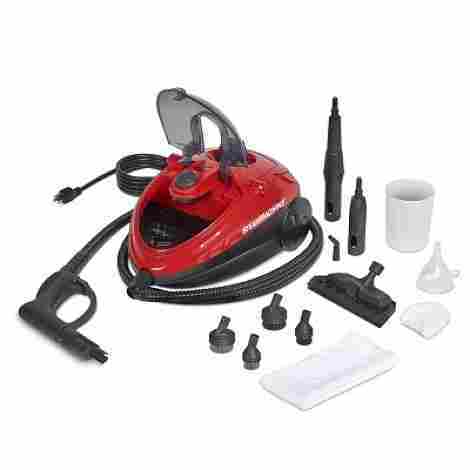 This steam machine comes with a carrying unit, a jet nozzle, 2 extension wands, a mop head, 2 microfibre attachments, a funnel, 7 different brushes, a squeegee and a scrubber pad. With a jet nozzle, this steam cleaner can put a lot of pressure in one area taking away tougher stains. This product is fairly inexpensive in comparison with similar products. This little guy is a tire dressing applicator. It provides a mess-free application to help clean up your tires and make them look brand new. Because of the handle on this device, it's easier to control the device, allowing more of the product to end up on the tire than your hands or the hub cap. The wave design on this product helps get into the smaller areas on the tires (like lettering) for easier and quicker application. This product is very inexpensive. It's worth the price especially with how convenient it is. Plus its machine washable so easier cleanup. This is not the first product from this brand on our top ten list. Chemical Guys seem to be one of the leaders in car detailing products. This wax gives a vehicle's exterior a 'seep wet look' and is made of 100% carnauba-based wax. This wax is made with carnauba wax which is the highest quality of wax available on the market. Not as long lasting as synthetic waxes however offers the best in shine available to consumers. This product protects from all of the earths harsh elements including the suns UV's, protecting the paint from fading over time. This product is very inexpensive. Because it is a liquid, it will go further and has potential cost savings down the road (no future paint jobs needed). This product is to clean the interior surfaces of your car. This product is meant for quick touch-ups. Unlike most cleaning products, this only cleans away. It does not leave any additional product behind that is oily or sticky. Can be used on leather and plastics without an issue, making it more versatile. This product is very inexpensive. For the cost and considering how easy it is to use, it's worth the price. 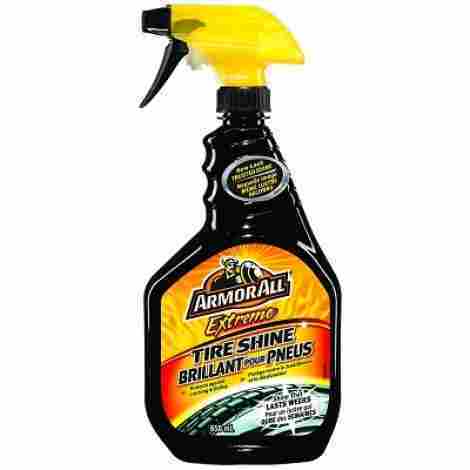 This is an ArmorAll tire shining product. It gives a mirror-like appearance while simultaneously protecting tires from the elements. Even with the wear and tear of the elements, this product will help preserve the exterior of your tires. Not only does it help protect against the elements but it will also make the tires look shiny and new. 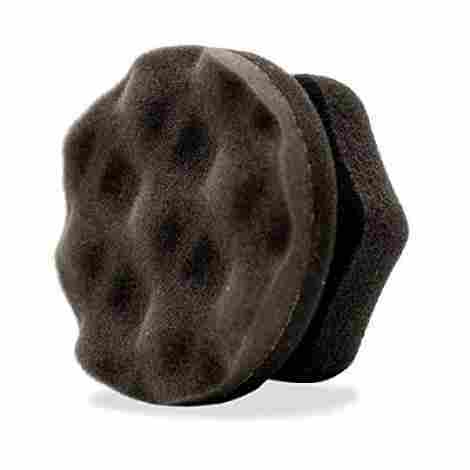 This is an ArmorAll product and therefore is sold in retail stores. It is very inexpensive and helps prolong the life of your tires ultimately saving you money down the road. This is another product from the Chemical Guys. It comes with 13 pieces including a porter cable buffer, 4 buffing pads, 2 microfibre drying cloths, 1 cleaning solution, 1 polishing solution, a wrench, a backing plate and a counter weight. The orbital tool head spins in a way that avoids hologram marks. It won't damage the paint on your vehicle and has the ability to spin between 2500 to 6000 circles in under a minute. This detailing kit comes with 5 different polishing pads for different purposes ranging from medium-heavy to ultra light finishing for all types of jobs. This detailing kit is in the middle of the price spectrum. The justification for the price is that it really does come with everything needed to clean and polish your car including 5 different buffing heads. In conclusion, this list will get every inch of your vehicle clean and polished. With easy-to-use applicators and easy-to-apply liquids, these products will have your vehicle looking as good as new in very little time. You don’t need to go to a professional cleaner to renew the look of your car. With a little bit of space and time these products will not only make your cleaning and polishing job easy but may even make it fun. Wear and tear on vehicles decrease the resale value however with a little maintenance you can keep the vehicle in better shape aesthetically. We hope this guide was informative to you. Below we have the criteria we used to evaluate these products as well as some common frequently asked questions. The quality of the materials (and liquids) is important to consider because this will both indicate the length of time it will last the buyer and the amount of money spent. If usage requires lots of liquid or if the product itself falls apart easily but is inexpensive, having to purchase more will cost in the long run. Quality over quantity will save money down the road. It’s also frustrating to have something fall apart in your hands halfway through the job. When searching for supplies we considered what material the product is made out of and if it has regular poor reviews. Additionally, the liquids being used should be able to not only withstand time once applied to the vehicle but also shouldn’t require too much liquid to get the job done. Liquids should have good blendability too, being able to rub into the cars paint and upholstery with relative ease, and not leave behind streaks or white marks. Along the line of quality materials, we also did some research about the different types of waxes. There are both synthetic and natural waxes (more details about which is better in the F&Q section below) and there are also paste, liquid, spray and colored options. Paste wax is a hard texture that requires quite a bit of working into the surface of the vehicle. This is one of the original waxes used for vehicles and though it lasts a long time is a little archaic in nature. Liquid wax is much smoother in texture and is much easier to apply than hard wax. We chose to recommend liquid waxes in this article because they are easier to blend in and are longer-lasting. They can either be made of natural or synthetic material. Spray wax is typically much thinner and is used in car washes. They are good for a quick wax job but don’t last very long. If not properly dried, they can also leave staining and streaks on your vehicle especially if the vehicle is darker in color. Colored waxes are pigmented to help with the color of the vehicle. They are usually used to help smooth out paint color due to paint defects or wear on the vehicle. The reputation of a company goes a long way. It’s not to say that companies with poor reputations won’t make a good product, but it’s less likely you’ll be happy with your purchase. Additionally, if the product purchased isn’t good it may be a hassle to return the product. We went with well-known companies that produce products with high consumer ratings. Anything with the words “I don’t typically like this company but…” was disregarded. We wanted to provide products that work for the consumer but also can be returned if the consumer is not satisfied. We also looked at companies that aren’t always sold in common places like Wal-Mart but rather looked for products that were used by professionals and cleaning services. We also looked at the longevity of the products being used. This ties into the quality of materials above, but the longevity is how long the product itself will work between uses. We didn’t want to provide waxes, for instance, that only last a day or two. We want your vehicle to look its best for as long as possible between cleanings. Of course, we can’t really control the weather and the weather can be so aggressive that no amount of wax could withstand it, but we wanted to provide products that stand out among its competitors in similar conditions. Keeping in mind that products that aren’t used by professionals will more than likely not last as long, however, we wanted to find products that were better than average. The tools we have at home may not match the tools that can be found in professional cleaners however they are products that are the best for how they are applied with the best products available that will do the job, last long and not hazardous to your skin and lungs. Of course, consumer reviews are a vital part of our process. Companies can hire people to really sell their product even when the product is terrible. You see so many products on the market that seem too good to be true by promising things that are extremely unrealistic. Consumer reviews help call out sellers bluffs and give fellow buyers a better idea of what the product is really like. Humans are more likely to leave a poor review than a positive one but that works for us. We really want to know what doesn’t work rather than what does. Additionally, what one person considers a flaw may not be a flaw to someone else. It’s good to sort through the reviews to truly get an idea of the product is right for us. At the end of the day, we don’t want to spend days cleaning and detailing our car (well, most of us don’t want to) so we looked at what products did the job quickly (and well), and what products came with the most variety of products. We didn’t want you to have to buy 25 products from 25 different sellers. We looked for ‘full-packages’ in order to make the buying and detailing easier for you. Vehicles have so many different areas that require different types of products but at least we could find either products or packages that would do the majority of the cleaning with very little need for additional products. We are surrounded by chemicals and some of them are safe and others are not. We looked at the chemicals within the products to both make sure that they were safe for you when applying but also made of ingredients that were ideal for your vehicle. We even included some steamers that were completely chemical free in order to get your car both clean and disinfected without leaving behind excess chemicals that could affect you, children or animals. Q: Do I have to go to a professional in order to get a professional clean? Of course not! If you have a space to clean your vehicle, have a desire to or just want to save money, cleaning your car from home can be easy if done with proper tools and materials. Q: Do I need to wear protective gear when using these tools or products? It’s wise to wear protective gloves when using them however none of the products in this article are corrosive. They may just be a bit drying. None of these products should go anywhere near your face and especially near your mouth or eyes. Each product has warnings on the bottles and boxes. Read each individually before using. Q: Do the steam cleaners get really hot? Yes they do. The AutoRight SteamMachine listed above can get up to 290 degrees F which could give you a really nice burn. Make sure that when you are using these products you are paying attention and using proper protection. The benefit to the level of heat is that it will really get into the fabrics of the car and disinfect without the need for harsh chemicals that can actually hurt both the materials you are working on but also the people and animals sitting on the fabric after the fact. Q: Can I use the steam cleaners elsewhere? Absolutely! The two listed in this article can also be used in the home and even on the BBQ if needed. They will cost a little bit but because they are so versatile they are worth the buy. Q: What are the differences between hard wax and liquid wax? They both do similar jobs which is help provide a nice shine to your vehicle to give the vehicle a new car look by appearing like the paint is new. Hard wax is fairly explanatory, the product itself is hard (usually a solid) while the liquid wax is a soft (liquid) consistency. Hard wax is better when you are using heavy duty tools like polishers. Liquid waxes, because they are easier to apply, are better for at home jobs. They spread easier, can be done without a polisher and won’t leave white marks like a hard wax would without a machine. They don’t typically last as long as hard waxes do however it’s much better for at-home jobs. Q: Can I use the same product to clean the interior of my car on the glass of my car? It probably won’t work out very well. The cleaning supplies for the inside of your car are intended to get rid of grease and stains and tend to have additional chemicals in them to break those things down. Typically you don’t find these types of grime on the windows of your car. You should be using a glass-specific cleaner for the glass instead. Some products, however, will go over what types of surfaces they clean. Read the product before using them on different types of surfaces to be safe. Q: Should I be using leather specific cleaner for my seats? You definitely should be. Leather needs to be taken care of a little bit more than polyester seats. The reason for this is leather breaks down a lot easier. Also, remember that leather cleaners typically have oil in them because they require moisture to stay in good shape. Oil will make your seats a little slick. Start really light with the leather cleaning products initially and build up as you go. Additional oil will not absorb into the seats and will make them very slick when you sit down which can be uncomfortable. The transfer over, as well, may be bad for your skin. Q: Can I use the steam cleaner on leather? You shouldn’t as it will ruin the leather. Use a leather specific cleaner instead, this will keep the leather in the best shape. If germs and bacteria are a concern consider using hot water and a cloth instead. This will help disinfect without ruining the material. Q: How do I clean my car engine? There are degreasing products available that are usually applied with an applicator of some sort (sometimes they are included, other times they recommend you use a paintbrush). 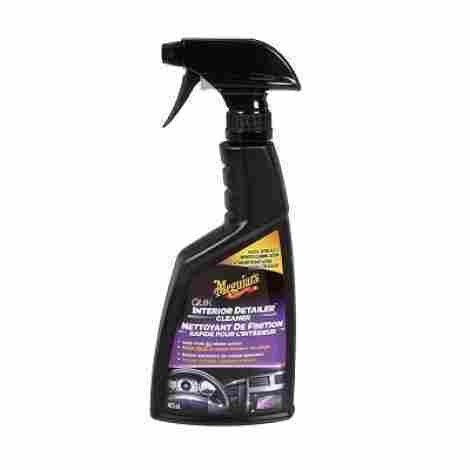 The degreaser will help break down any extra grease on the engine. Ensure before applying the degreaser you are removing any leaves, twigs, and debris. You also want to disconnect the battery to ensure that any water going into the area is not going to damage it. Disconnect and fully remove the battery before cleaning out the degreaser. After the degreaser has sat for the amount of time indicated on the bottle, use a wire brush and scrub around the engine. After you have scrubbed you can take a hose and rinse out the engine. Remember to avoid getting any of the degreasing solution on the vehicle and not to get any water in the electrical areas of the inside of the car. When it is rinsed allow everything under the hood to dry before connecting the battery and driving again. Q: How do I store these products? The sponges should be either cleaned after (some are machine washable) or they should be put in a sealed bag in order to preserve their life. Remember that if you are throwing these items in a washing machine it may either wreck the machine over time or leave a film on the inside of the machine that will damage your clothes. It makes sense to either use an industrial washing machine or washing them by hand in the sink. The liquid products should be left in cool, dry places like a garage and they should be kept upright. They shouldn’t be exposed to too much heat or too much cold either. The lids of these products should be securely on and they should not be within reach of children. Q: What type of wax is superior? It depends on what you are doing. There are both natural and synthetic waxes on the market. Natural carnauba wax (like the wax used in the Chemical Guys wax in this article) is derived from palm tree leaves. It is usually recommended for darker vehicles but can be used on lighter ones as well. It is the most expensive of the waxes. Synthetic wax is more of a paint sealant. It is used to bond polymers to paint. Polymers are usually more durable than natural waxes but don’t provide as nice of a shine as natural waxes.